Natural enemies play an important role in managing pest populations. Using predatory mites in strawberries against spider mites is a good example where growers take advantage of the potential of the natural enemies. Multiple species of predatory mites are commercially available and several California strawberry growers use biological control as a complementary tool to chemical control. Predatory mites belong to four categories – Type I, Type II, Type III, and Type IV. Type I: These predatory mites are specialists feeding exclusively on spider mites (family Tetranychidae) that produce considerable webbing. They require feeding on spider mites for their survival and reproduction. Type I predators are aggressive and voraciously feed on pest mites. Because of their dependence on spider mites, Type I specialists rapidly decline and cannibalize when pest mite populations decline. Type II: These are also specialist predators, but they feed on spider mites and other species of mites. They also feed on pollen and in some cases on thrips and other species of predatory mites. Having more food choices for survival and reproduction, Type II specialists continue to be present in the absence of spider mites and are less likely to cannibalize. Type III: These are generalist predators that feed on multiple species of mites that include spider mites, eriophyid mites, and tarsonemid mites and insects such as thrips and whiteflies. They also feed on pollen, honeydew, and plant juices. Type III generalists are also known to cannibalize and feed on other species of predatory mites in the absence of pest mites or other food sources. Type IV: These mites primarily feed on pollen and can also feed on pest mites. 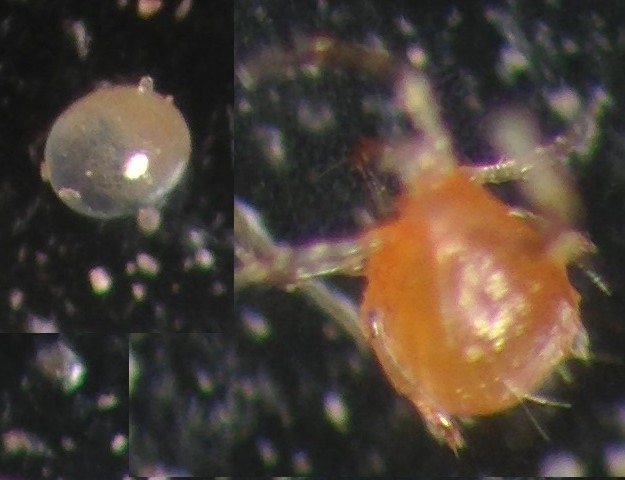 There are five species of predatory phytoseiid mites (Acari: Phytoseiidae) that are commercially available for spider mite control. Phytoseiulus persimilis Athias-Henriot is a Type I specialist that exclusively feeds on spider mites. It is bright orange, teardrop-shaped and moves rapidly. It prefers cooler temperatures and is sensitive to hot and dry conditions. So, it is more effective during earlier parts of the production season before temperatures increase. Egg and adult of Phytoseiulus persimilis. Egg is slightly oval and larger than twospotted spider mite eggs, which are round. Being able to identify predatory mites and their eggs is important during pest monitoring (Photo by Surendra Dara). Neoseiulus fallacis (Garman) is a Type II specialist that primarily feeds on spider mites. It is translucent to peach or orange and appears to have a flatter body compared to spider mites or P. persimilis. It is also sensitive to hot and dry conditions. Neoseiulus californicus (McGregor) is a Type II specialist that primarily feeds on spider mites, but also has Type III generalist characters. It appears similar to N. fallacis. It can withstand warmer conditions better than P. persimilis and N. fallacis. It can withstand cold temperatures for short periods and tolerates relative humidity range from 40-80%. Egg and adult of Neoseiulus sp. Similar to the P. persimilis egg, this is also large and oval (Photo by Surendra Dara). Galendromus occidentalis (Nesbitt) also known as western predatory mite is a Type II specialist that primarily feeds on spider mites. It prefers warm temperatures and tolerates dry conditions as low as below 30% relative humidity. It is sensitive to cooler temperatures. 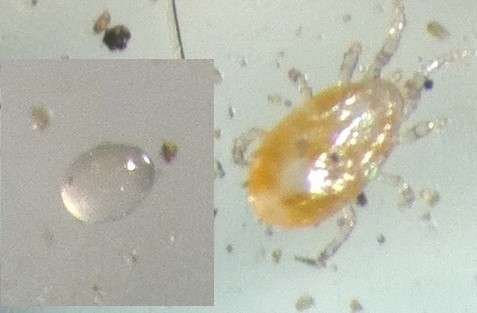 Egg and adult of Galendromus occidetalis along with spider mite egg in the middle. Photo by Jack Kelly Clark, UC IPM. Amblyseius andersoni (Chant) is a Type III generalist predator. It can tolerate high temperatures when relative humidity is high. Among these predatory mites, P. persimilis, N. fallacis, and N. californicus are the most commonly used species in strawberries. Using the right species depending on the environmental conditions is important for the success of biological control. Timing insecticide and acaricide applications in a manner that is least disruptive to the predatory mites is essential. When chemical pesticides are necessary, softer materials should be selected. In addition to the predatory mites, several species of natural enemies feed on spider mites. They include big-eyed bug (Geocoris spp. ), black lady beetle (Stethorus sp. ), black rove beetle (Oligota oviformis), brown lacewing (Hemerobius spp. ), damsel bug (Nabis spp. ), green lacewing (Chrysopa spp. ), minute pirate bug (Orius tristicolor), predatory midge (Feltiella acarivora), and the predatory sixspotted thrips (Scolothrips sexmaculatus). Bottom row: Damsel bug, predatory midge larva, minute pirate bug, and sixspotted thrips. Photos by Jack Kelly Clark, UC IPM. Croft, B. A., L. N. Monetti, and P. D. Pratt. 1998. Comparative life histories and predation types: are Neoseiulus californicus and N. fallacis (Acari: Phytoseiidae) similar type II selective predators of spider mites? Econ. Entomol. 27: 531-538. Çakmak, I. A. Janssen, and M. W. Sabelis. 2006. Intraguild interactions between the predatory mites Neoseiulus californicus and Phytoseiulus persimilis. Exp. Appl. Acarol. 38: 33-46. Surendra you are going to discuss these different types of predatory mites at our UCCE mite meeting May 30 at the ALBA facility on 1700 Old Stage Road, correct? Yes, Mark. I will be discussing these details at the workshop.